Secretary of State says Israel is "is everything we want the entire Middle East to look like". 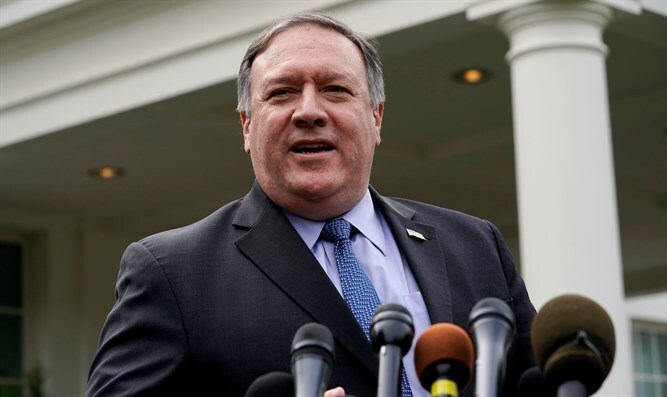 Israel “is democratic and prosperous, it desires peace, it is a home to a free press and a thriving economy,” said Pompeo, who spoke at the annual Jewish Institute for National Security of America (JINSA) dinner in Washington. “Compare that to Iran, whose corrupt leaders assault the human rights of their own people and finance terrorism in every corner of the Middle East. Rarely in world affairs is the contrast between two sides so stark. Under President Trump’s leadership, the United States is standing where it should firmly be: On the side of Israel,” he added. "For the previous eight years, we had an administration that had more respect for the leaders of Iran than it did for the State of Israel," the Secretary of State said, before denouncing the Iran nuclear deal that was signed under the Obama administration and from which Trump withdrew in May. “President Obama thought that if he made dangerous concessions, removed economic sanctions and flew a plane full of cash to Tehran, he could somehow hug Iran’s leaders into behaving well…but those leaders aren’t from a Disney movie. They’re real. They are murderers and funders of terrorism who lead chants today, still, of ‘Death to America,’” he continued. “The bottom line is that the US-Israel relationship is stronger today than it has been ever, and that’s good for both countries,” said Pompeo. Pompeo also noted that the administration is making “a truly historic push for peace between Israel and the Palestinians”, a reference to the Middle East peace plan being prepared by Trump’s senior adviser, Jared Kushner, and his Representative for International Negotiations, Jason Greenblatt. The Secretary of State provided no further details other than saying the plan will be released "before too terribly long, and we are hopeful that both sides will have constructive conversations to lead to that."